Back in the day, when the Genesis was popular, a new video game system was released: the Neo Geo. To my knowledge, only one video game store in Puerto Rico (my home country) carried it, called "Kidoko." Most of their merchandise was games and hardware for the Genesis and the Super Nintendo. They had, however, some Neo Geo games at a little corner, close to the counter. One day a young man approached the manager and said he wanted to buy a Neo Geo. He told him that even though they had the games in stock, they only got the console if the costumer made a special order through them because it was so expensive. The young man seemed a little disappointed, but me made an order for the Neo Geo, and bought a Neo Geo game right then and there. I believe it was Fatal Fury. Several feelings went through my mind when I saw that. First of all, I believed the prices were outrageous, and I couldn't understand why would anybody buy that. I was also very surprised that he had the money to buy it, and was impressed when he bought the cartridge right there. I wondered how he got the money. Now I'm thinking that maybe he worked and has been saving the money for a while. I also remember seeing advertisements for the Neo Geo at the video game magazines of the time. Specifically, I remember an ad that compared other consoles to a plain, small, hot dog, and the Neo Geo to a huge hot dog full of toppings. Even though the Neo Geo was not popular among my friends (none of my friends had one), it was rather popular in the arcades. I remember the Fatal Fury, Samurai Shodown, and later, King of Fighter series were popular at the time. Kids lined up next to the cabinets to either play these games or watch others play. On one occasion, a more experienced player was teaching a beginner to make the semi-circle with the joystick to make a move in Fatal Fury 2. The reviewers of a video game magazine called Game Fan loved the Neo Geo. I remember they made a review of a shooter called Pulstar for that system, complete with many colorful and beautiful screenshots, and they were all excited about it. I thought it was funny that they said that it was so difficult that, according to them, it was not a game for children, but it was "a man's game." I did end up buying Fatal Fury 2 and Samurai Shodown for the Genesis, and I loved them. They didn't look as good as the arcade version, but they looked very good for the Genesis and kept the gameplay intact. Plus they were much more reasonably priced than the originals. Eventually, consoles like the Saturn and the Dreamcast equaled or surpassed the Neo Geo's power, so it wasn't as appealing anymore. It was still rather popular at the arcades, and people still played games like Metal Slug and Bust-a-Move on it. But I moved on to other consoles and mostly forgot about it. A few years ago, however, I found out that some people were turning Neo Geo arcade motherboards into consoles. And they were doing that because games for the Neo Geo arcade were cheaper than the console ones. On a whim I bought one. I also bought 4 games for it through a Neo Geo fan website. I played with them occasionally, but now my interest for the Neo Geo came back because I'm waiting for a portable console that plays emulated games (including games for the Neo Geo) to be released. It's called the GPH Wiz. So I started playing both the games I was familiar with and other games I didn't know about, like Last Blade 2. I also started buying "real" Neo Geo games once more. Believe me, they feel different on "real hardware" as opposed to under emulation, even though current computers are more than powerful enough to run these games properly, and I have a good game controller for my Mac. What can I say? I like old video games. They bring me good memories from my adolescence and early adulthood, and many of these games are easy to pick up and play for a few minutes, without requiring a lot of your time on one sitting, unlike other games like simulations and RPGs. And with the Neo Geo specifically, I can finally afford them now that I have a real job. You can see the games I have for the Neo Geo system below. Just so you know, since these games were for the arcade, they didn't come with the high-quality, colorful boxes you see. 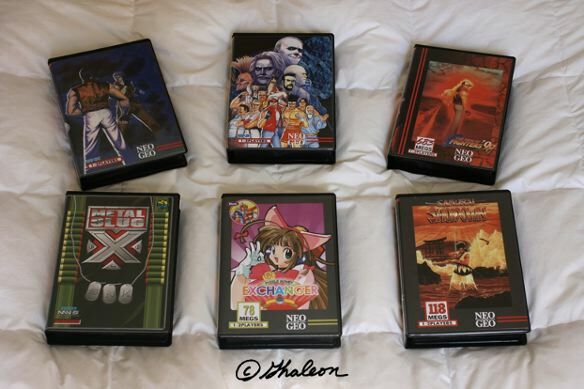 These boxes were made by fellow Neo Geo fans out of love for the system and its games.